When an investigation into a series of mysterious deaths leads agents to an elite prep school for rebellious kids, MI6 assigns Alex Rider to the case. Before he knows it, Alex is hanging out with the sons of the rich and powerful, and something feels wrong. These former juvenile delinquents have turned well-behaved, studious?and identical?overnight. It's up to Alex to find out who is masterminding this nefarious plot, before they find him. This is a great book about a boy named Alex Rider. He works for an undercover British agency called M16. M16 sent him on a mission to a school called Point Blanc that was meant for kids that were horrible students. He is expecting something horrible, but when he gets there all the students are perfect. He makes a friend named James who isn't like all the other kids. James always skips class and never does his homework. James tells him that all of the students used to be bad like him until one day they suddenly changed. One day Alex hears James scream during the night. He tries to go investigate, but he realizes that his door is locked. This is a great book full of thrills, suspense, and detail. I think Anthony Horowitz did a good job writing; Point Blanc. This book didn't let me put it down. Horowitz creates an amazing plot that threw me side to side, made me hold my breath, and brought out my emotions. If you like this book you should try the other books in the series that Anthony Horvitz has written: Storm Breaker, Skeleton Key, Eagle strike, and Scorpia. I would recommend this book to people 8-15 years old. This is one of my favorite books. Anthony Horowitz is a great author. He wrote the book Point Blank. In this book this kid Alex Rider has to spy on this academy called Point Blank in the French Alps. The main characters are Alex Rider and Dr. Grief, the owner of the academy. The theme is to try new stuff. My favorite part is when Alex kicks one of the bad guys through the window. I recommend this book to kids 9-18. I hope you read this book. The book point blank is one of the best books that I have ever read. If you like action then this book is full of it. the story starts with this very rich man in his normal ever day routine. But when he gets too his office building every thing changes. First off he dosen't get any coffe and he hass for so many years. His employers no right then and there that somthing is up. Also since his routine is public all his enemys can see him. The book's author is Anthony Horowitz. The setting of the book is in London and France. I think it's a great book because its part of a series that's fun to read. I recommend this book for kids who like James Bond adventures. 14 year old Alex Rider is also a member of Britain's secret service. Finally released from his training by MI6, Alex Rider is headed for a private school in the Alps because the mountain academy is linked to the deaths of two important men. Just like 007, Alex is equipped with special gear such as an exploding stud earring and a CD that doubles as a buzz saw. Alex finds himself in a few tight spots. His courage prevents the school's directors from using young clones to take over the world. An exploding helicopter, a machine gunning strike force, and other shootings provide standard spy style violence. There's even a Bond ending with a last minute villain to be elimanated. With a plastic case that is both durable and that gives him infromation. I liked this book because there was a lot of action for all the people that like action books or movies like James Bond. Anthony Horwitz did an exelent job writing the book and putting just enough suspense and action. This book is a good book to read in class. I rated this book 4 out of 5 stars because iu really like the action. The Action-Packed Book You Can't Put Down! Have you ever wanted to be a spy? Going around saving the world with the cool gadgets you see James Bond movies? 14 year-old Alex Rider DIDN'T want to be a spy. He just wanted to be a regular kid. Well, that's not what fate planned for him. His only relative dies in a "car crash" and all of a sudden Alex's life is sucked into England's Military Intelligence, MI6. From then on he travels reluctantly around saving the world from evil. Alex Rider's latest mission is called Point Blank. He is equipped with a bullet-proof ski suit (including night-vision goggles,) a book with a tranquilizer dart lodged in its spine, earrings/grenades, and a CD player/saw. He has all this special equipment for an academy called Point Blanc, an academy for the children of very rich parents. Since Alex's only relative is dead, he takes on a secret identity. When Alex arrives in Point Blanc, Dr. Hugo Grief and Ms. Stelenbosch, the supervisor and assistant supervisor, show him around. In the academy, Alex notices that everybody except his friend James and himself is acting strangely obedient. Later, in the night, Alex hears some weird noises. Now, everybody including his friend is acting strangely obedient. Something's going on and Alex wants to find out! When I read this I felt like I was with Alex Rider the whole time. I was there when he was assigned the mission. I was there at Point Blanc. Everywhere Alex was, I was too. This is a great action-packed book and I can't wait to read more of the Alex Rider Series. What do you get when you cross Harry Potter and James Bond? Why, Alex Rider, of course! Alex Rider is 14 year old secret agent working for MI6 who just wants to be a normal kid. But MI6 just doesn't want to give him a break. This time he's at a finishing school in France to investigate, and find out if the deaths of Michael J. Roscoe and Viktor Ivanov have anything to do with Point Blank academy, considering both of their sons go to Point blank. While he is there he discovers that the students there are being cloned by the school director Dr. Grief as part of his plot to take over the world. Despite all of the guards at Point Blank Alex still finds a way to kill Dr. Grief. Until the end when Dr. Grief returns for revenge. Out of five stars I'd give it a four. Over all I thought it was pretty good. I think the author did a very good job of describing the characters, but I was not very impressed with how he described the scenery because I could not visualize what the insides of the building looked like. So remember if you like action and adventure books than Point blank is for you. I highly recommend this book to anyone. It is an exciting book that you won't want to stop reading. This story is called Point Blank is a sci-fi story. It is about a young boy named Alex living without any parents or any guardians. Also he is owned by the government and being used as a spy. He is assigned a mission to go to a school and see what they do. He finds out that they are making illegal clones. This book was okay but it left you hanging and had some parts that were un-needed. Though it did have some very exciting parts that blow you away. I think you should not read this book because it leaves you hanging in the end. Great series, the best of the series. 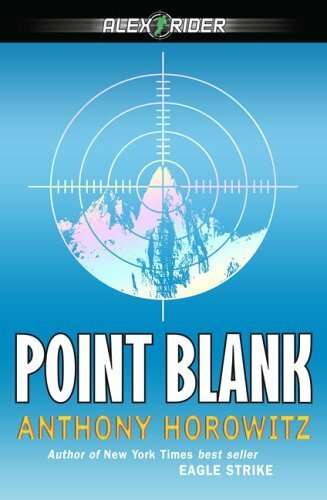 I was inspired to read Point Blank because it was the second book in the Alex Rider series. Storm breaker, the first book, was so good that I had to read the second one. I'm glad I did. I am anxious to read the other books in the Alex Rider series as well. Alex Rider, a 14-year-old M16 agent, is assigned to a top secret mission in the Swiss Alps. Two mysterious deaths lead Alex to a boarding school for rich, rebellious boys. The boys are acting strange, and it's up to Alex to find out who, what, where, when, and why. I like Point Blank because it has plenty of action, spy gadgets, and things that go BOOM! I also like the fact that the main character is around my age. Anyone who likes James Bond, spies, and who is in middle school through high school would love this book. Girls would probably be the only ones who would dislike this book because of its intense action and lack of romance. This book is a must read for all people who enjoy this kind of thing. MY REVIEW OF THIS COOL BOOK!!!!!!!!! Synopsis: Alex Rider, a fourteen year old spy who works for England's MI6, gets sent to Point Blanc Academy after a man named Michael J. Roscoe, a super-rich man who had a son at Point Blanc Academy, gets murdered. MI6 suspects something wrong at Point Blanc and sends Alex as the son of Sir David Friend. Before Alex can go, he gets sent to a military base for training. He acquires an enemy, Wolf. But after a while, they start to get friendly, When Alex arrives at the Friend residence, the first person he meets is Fiona Friend. Fiona is somewhat of a spoiled brat. While Alex is at the Friend residence Fiona does whatever she can to get rid of him, including trying to shoot him with a shotgun. When Mrs. Stellenbosch, the school's assistant director, takes Alex to a hotel on the way to Point Blanc, Alex suspects something wrong. The search is on. When Alex arrives at Point Blanc, he only has one friend. His name was James Sprintz. When Alex hears James screaming in the middle of the night, he knows something is wrong. Cloning? When Alex tries to go back to MI6 he is chased and shot at. Does the director of Point Blanc Academy, Dr. Grief, have something to hide? Alex is sure of it now. But just what does he have to hide? You will have to read the book to find out. Commentary: I would have to say that I love every thing in this book. There was nothing I would do to improve it. I like this book because of all the action such as snow mobile chases, machine gun fights, and unarmed combat. Comments: I would say that this book is more leaned towards boys. If you do not like action and death I would not recommend this book to you. Wow, can a 14-year-old really do these things? Take an oddly structured mansion. Add a crazed genius. Add a freakish, muscle-enhanced woman. Put in some juvenile deliquents. Wait, make them the sons of very wealthy men. What do they have in common? Why, Alex Rider, of course, of England's M16 spy agency. A 14-year-old spy? Yes, that would be Alex. Did he ask to be a spy? No, he did not, but he rose to the occasion when it was demanded of him. The remarkable aspect of "Point Blank" and "Stormbreaker" before it is that writer Anthony Horowitz makes the whole thing so believable. When Alex does the most extraordinary things, I found myself thinking, Not beyond the realm of possible (in other words--doable). How does Alex find himself in the dilemma of juvie thrust into a highly disciplined all-boys school? His outrageous behavior, of course. What he tries to do with a houseboat is possibly not beyond possible and he is put into jail, later rescued by M16 and pretty much forced into involuntary service once again. This time his job is to learn what is going on in this special school for unmanageable boys of rich men. Two of their fathers were killed in "accidents" in a fairly short period. What Alex learns becomes more and more bizarre (but believable). The ultimate occurs, however, when his true identity is learned. The reader can trust that wherever Alex Rider is will be mayhem and maybe a murder or two. "Point Blank" is no exception. One of the best book I have read, I loved it, the first book Stormbreaker was good, but this is just brilliant, my favorite Alex Rider book. Anthony Horowitz is at it agian by releasing the second book of the Alex Rider series Point Blank. In this book, Alex is forced into another adventure by MI6. Alex is sent to live with one of the richest people in the world and is almost killed before his real mission has even started. Next, he is sent to spy on another madman, Dr.Greif. The book you are about to read is called Point Blank by Anthony Horowitz and has a total of 215 pages. The year published 2002 by Philonel Books and is a fiction book. You are about to read a book involving a boy named Alex Rider that goes through a lot to find a connection between the two deaths and the institution Point Blank. The setting starts in England then later goes to France. The story is tolled in third person. The major characters in the story are Alex Rider, Dr. Grief, Mrs. Stellenbosh, Blunt, and Mrs. Jones. Alex Rider is the protagonist trying to stop the antagonist Dr. Grief from completing his plan. Major conflicts in the story are Grief vs. Alex is Grief stopping Alex from getting out of the institution to get help and wants to kill him. Alex vs. nature when he goes to escape the institution the snow starts to disappear to make it hard for him snow board down a hill with ironing board. Alex vs. Fiona is a conflict that begins the first time they meet eachother when Alex has to stay at her house for a little while. This book shows one should have trust in his own abilities before you can trust someone else is a theme of the story. The basic plot of the story is that there is a place called Point Blank located in France and 16 of the wealthiest children that are sent there because of their behavior in school and to parents. When they 16 kids are sent back they are identical but act totally different is this an evil plan by Dr. Grief to take over the world and if so can Alex Rider stop him in time? Point Blank is a great book if you like spies and there are awesome gadgets that can be many different things at once. If you like a lot of action because you fall asleep reading other books in this one it is hard to put the book down for a little bit and even try to fall asleep. I do think that there are no weaknesses in this book at all but there are strengths in this book such as keeping you on the edge of your seat and also by making you feel as if you are a spy in trying to stop some evil guy. The theme of this story is relevant because anybody can relate to it by if you don't trust yourself how you can trust someone else with your life. Writing in this story is powerful because it is like it has the power to keep you reading for a long time without wanting to stop until you are done. As you can read this story has a lot of great thing to make it great book keep getting passed on to generation to generation. This book left an impression on me on how life is so valuable and how people can just take advantage of it so easy. I recommend this book if you like action filled and suspenseful books then this book is the right choice for you. Point Blank is the second in the Alex Rider series, after Stormbreaker. Point Blank is about a 14 yr. old boy named Alex Ride (duh) who is a secret agent for M16, the FBI in England. Alex is forced to go to a school to become a better boy but he actually goes as a spy. He goes as Alex Friend and pretends like he is all messed up. Then one night he hears his only friend at the school yelling and he sees the adminastaters at the schools carrying him down to the basement (where they are forebidden). Alex follows them and finds out the secret to the perfect boys. To find out the ending you have to read Point Blank!!! This is a great book for girls and boys. It's a mystery/adventure. If you liked Stormbreaker, you'll love Point Blank. I liked how you went from one adventure from the next. You'll love POINT BLANK!!!!!!!!!!!!!!! When i first read stormbreaker i read it in about half a day, i was addicted, i couldn't stop reading. When i finished i thought to myself that i probably wouldnt be gripped like that by a book in a long time to come. The next day, i bought Point Blanc and i found myself very mistaken. Point Blanc gripped me like a vice and i highly recommend it. The book starts 2 weeks after Alex's first mission and to his surprise, M16 need him again, this time he is to go under cover to Point Blanc academy, an isolated bording school for rich rebel boys in the french Alps, to investigate two "accidental" deaths of rich men, both of whos son goes to Point Blanc academy. But can Alex figure out what's going on before it's too late? I bought this book for my daughter for Christmas. It was one of many in this series on her wish list. She tells me that both boys and girls in her Junior high love these books. They are action packed and she can't seem to put it down once she starts it. We went to a book store before Christmas and she wanted to buy a couple of books to read before Christmas - she chose this one and I had to tell her to please choose a different one.